For some antique furniture is about collecting a set of having an entire house just styled in a certain way. For others, owning antique furniture is about tapping into a heritage that is long lost and keeping it close to the heart. Either way and whatever your reasons, Chennai has quite a few antique furniture stores that you can visit to find some of the most exquisite pieces for your home. And if you’ve been struggling all along, let us help you out. 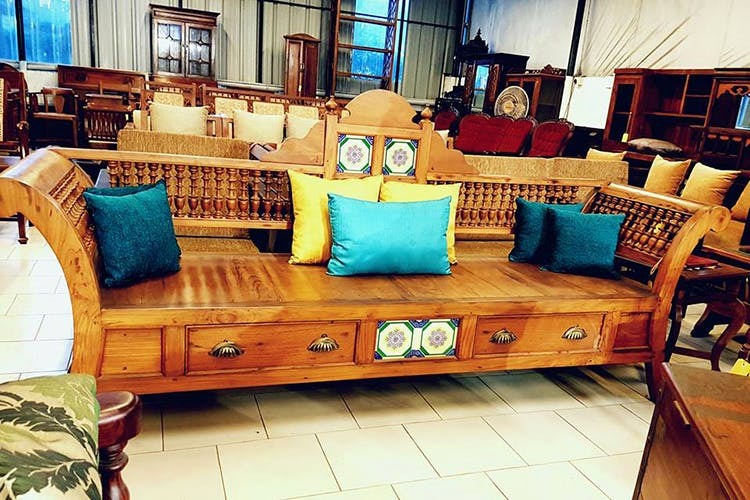 Located just at the bridge leading from Nungambakkam to Chetpet, the Old Wood Factory has all kinds of antiques from beds to tables to chairs and even sofas. Known for their antiques (the name says it all, really), this store has a multitude of things to choose from. And if you’re lucky, they might have just gotten a few new pieces of antique furniture that is perfect for you. Located on Mount Road (opposite Spencer Plaza), the Old Curiosity Shop has stood the test of time. Also known as the Kashmir Art Palace, the shop is filled with mostly trinkets and gifts that are a perfect depiction of India, Kashmir and even Chennai over the years. While the presence of furniture isn’t as much as everything else, if you look long and hard enough you’ll definitely come across some old chairs that you can fit into your home. But clocks, lamps, sculpture and more are available by the dozens and you can’t miss out on this at all. First opened in Trivandrum, Kerala, Antique Home Décor (also known as AHD) has mostly teak and rosewood furniture from Kerala in the stores. Their only store outside of the state is in Chennai and you can find furniture that is authentic, well-crafted and perfect for almost any home in the country. They only have furniture made from teak and rosewood, so you can be guaranteed good quality products for the right price. Sofas, dining tables, cabinets and divans are some of their specialities in the Chennai store. Started in 1999, Indika (India in Greek) is a large store in Kottivakkam with vintage, colonial and antique furniture. Not only do they have furniture in teak and rosewood, but they also provide the restoration of antique furniture. Their 5,500 square feet store has everything from book cases, sofa sets, poster bed, desks, swings and even antique doors and columns. The furniture is kept in its authentic state and once selected, Indika offers a restoration which includes a natural finish to highlight the quality of the wood. One of the best known antique stores in the city is Rani Arts, with the large white store opposite Ega Cinemas, everyone knows that some of the best pieces of furniture can be found here. Besides antiques, Rani Arts also specializes in handicrafts. Their furniture is reproduced from original antiques of the British Colonial era and finished by hand, giving it a perfect touch. They have chairs, dining tables, beds and even mirrors with intricately carved wooden frames. And here’s the best part, you can shop online and they will ship the products to anywhere in the world.